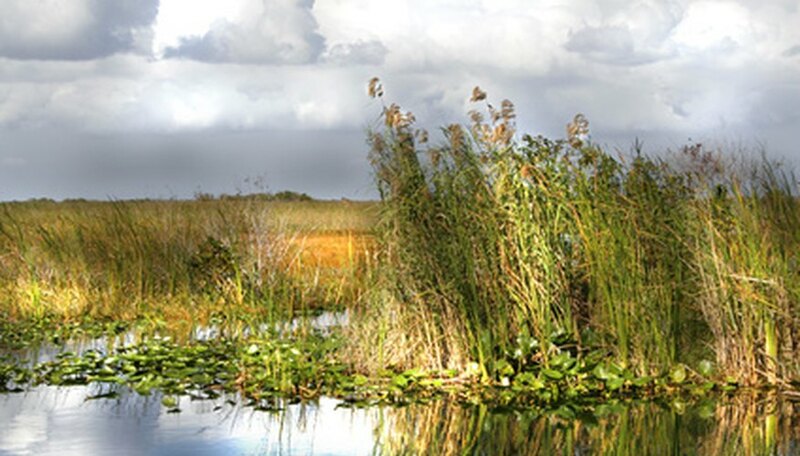 A variety of native grasses grow in the Everglades, a large subtropical, swampy wilderness area located in southern Florida. This unique area features two seasons, a dry season that runs from November through April, and a wet season that occurs from May until October. The grasses growing in the Everglades adapt to these conditions, including the way they respond to fires that occur during the dry season by quickly reestablishing themselves once rain falls again. Sawgrass dominates the grasses growing in the Everglades, covering thousands of acres of marsh from the Kissimmee River to Florida Bay. Known as the “river of grass,” the huge areas of saw grass extend as far as the eye can see. The grass, actually considered a sedge, features needle-sharp leaves that grow up to 6 feet or more in height. The grass grows in shallow water sitting on top of a porous but hard limestone rock bed. Thanks to its minimal nutrients requirements, sawgrass thrives and continues to spread in spite of these conditions. Also known as pineland threeawn, wiregrass grows in dense, spreading tufts reaching up to 3 feet in height. The long, needle-like leaves sport fine white fuzz around the base while the tiny flowers feature 3 hair-like tentacles that protrude from each flower. Wiregrass produces a tiny, yellowish grain seed. The grass only grows in southeastern Florida, including the Everglades, where it grows back very quickly after fires. Gopher tortoises and quail rely on the grass as an important food source. The grass also provides cover for birds, animals and reptiles. Native, warm-season cutthroat grass grows up to 4 feet in height with leaf blades that twist in dry weather. The grass produces a purple seedhead that reaches up to 10 inches in length. Cutthroat grass grows and propagates from thick rhizomes. The grass thrives in highly acidic, sandy soil in partially sunny areas, helping to control erosion. The grass creates cover for birds, animals and reptiles. Toothache grass, a warm-season, perennial bunch grass, grows on wet sites in the Everglades. The grass grows to more than 3 feet in height with leaves that appear pale green on the bottom and dark green towards the top. The name of the grass comes from the stem, which contains a substance that deadens feeling in the tongue and gums when chewed. The seedhead consists of seeds growing on a curved spike with the whole seedhead resembling a comb. The soil thrives on wet, poorly drained, acidic soils in sloughs and the edges of woods where standing or slow-moving water exists after heavy rainfall.